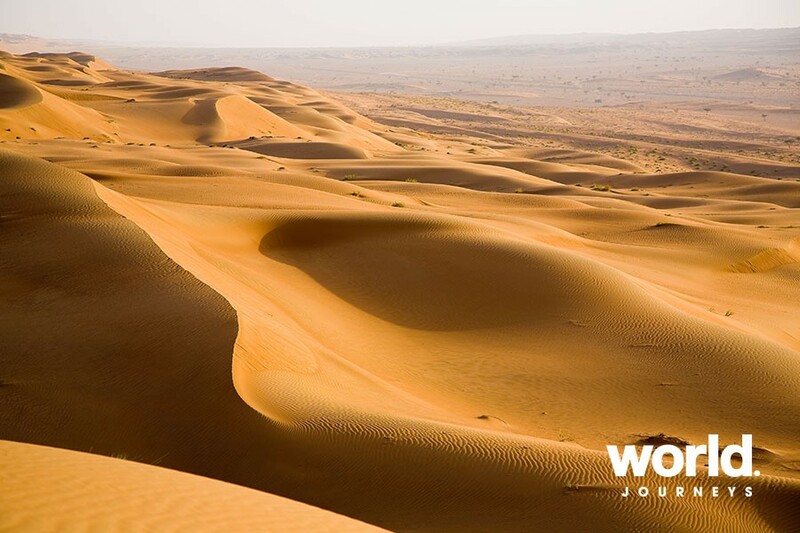 Experience the Wahiba Sands, a vast mass of undulating red and white sea of sand where the ever-changing patterns of the dunes are a photographer's delight! 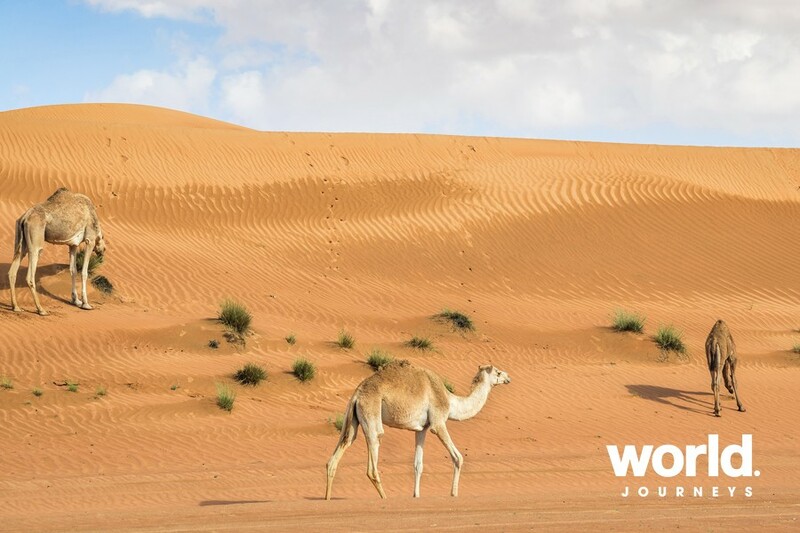 Delight in desert adventures as you stay one night at a Desert Camp with options to go on exciting sand dune safaris, camel rides, sand buggys or even try sand skiing! 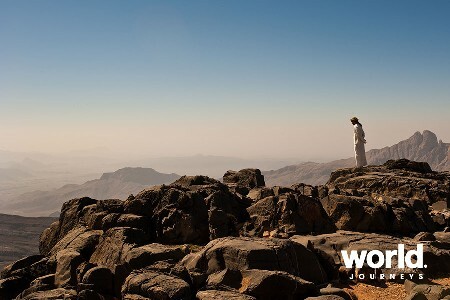 Travel to Wadi Bani Khalid, an oasis in the middle of the barren and dry mountains. It is one of the most beautiful wadis in Oman with pools with clear deep blue water. Then head for the coastal town of Sur, renowned for its dhow shipyard in bygone era. 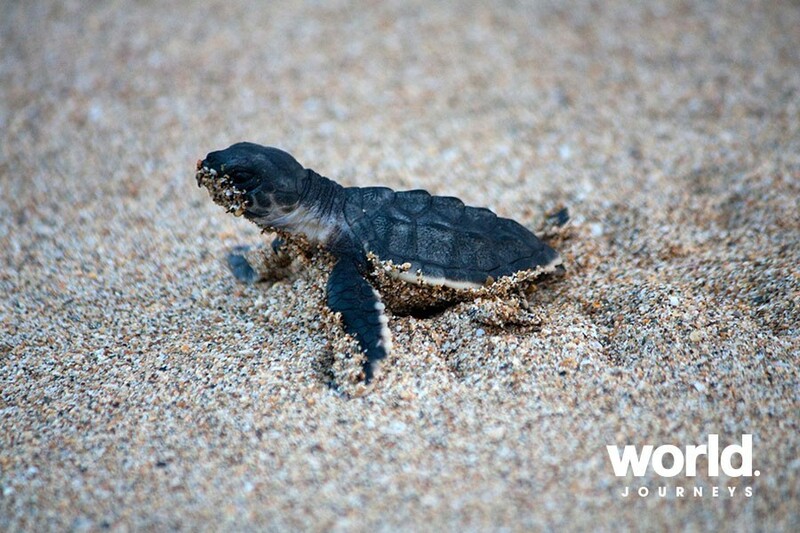 Then continue to Ras Al Jinz and visit the turtle sanctuary! 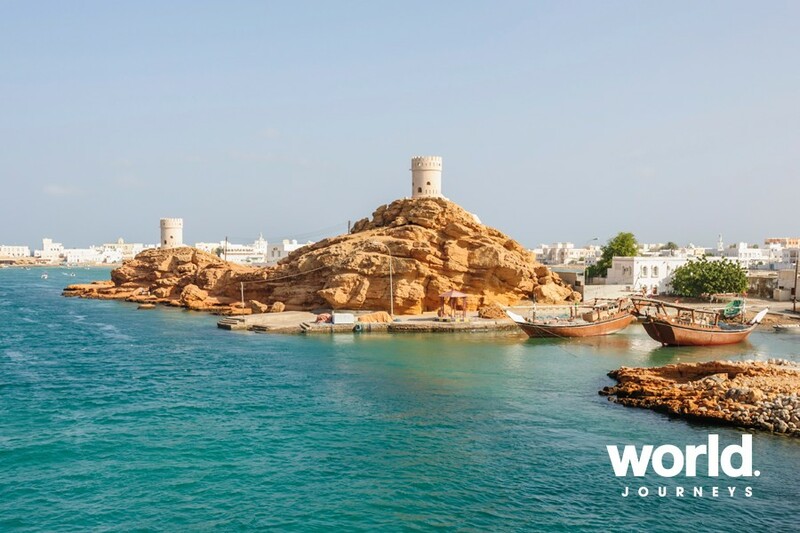 Return to Muscat via the scenic coastal road visiting the Bibi Mariam Tomb in Qalhat, Wadi Tiwi, Fins Beach, the limestone Sinkhole in Bimah and Village of Quriyat. 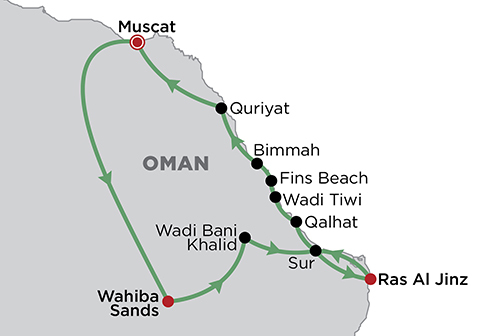 Day 1: Muscat > Wahiba Meet your driver guide at the hotel/ airport and drive into the Wahiba Sands- a vast mass of undulating red and white sea of sand. The ever-changing patterns of the dunes are a photographer's delight. You will visit the home of a Bedouin Family in the desert, where you will be invited for lunch. After check-in at your Desert Camp, your experienced drivers will take you on some exciting sand dune driving. Back at the camp you may want to go on a short camel ride, drive a sand buggy or try some sand skiing. Soon after the sun has sent its last rays over the golden desert it will be the time for a BBQ Dinner under the stars. Overnight stay at Desert Camp. Day 2: Wahiba > Sur Our first destination today is Wadi Bani Khalid - an oasis spot in the middle of the barren and dry mountains. 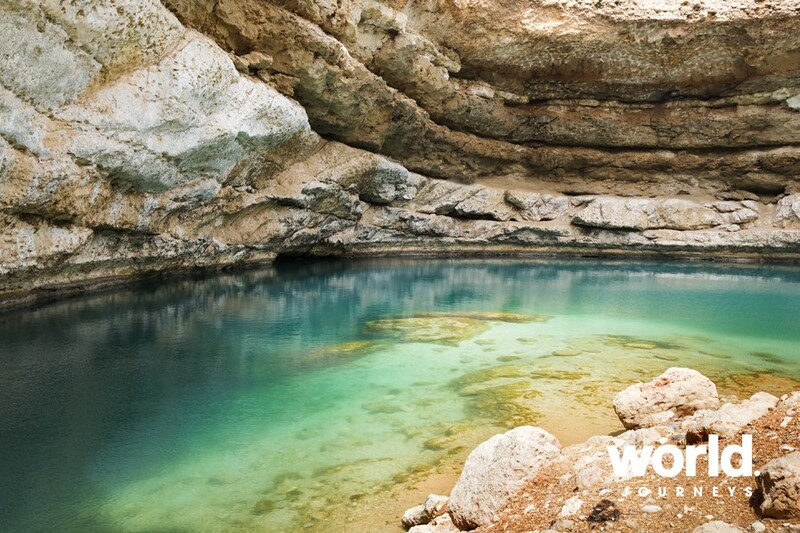 It is one of the most beautiful wadis in Oman with pools with clear deep blue water. Maybe you will catch a glimpse on the small hamlets that cling precariously to the rugged mountainside. 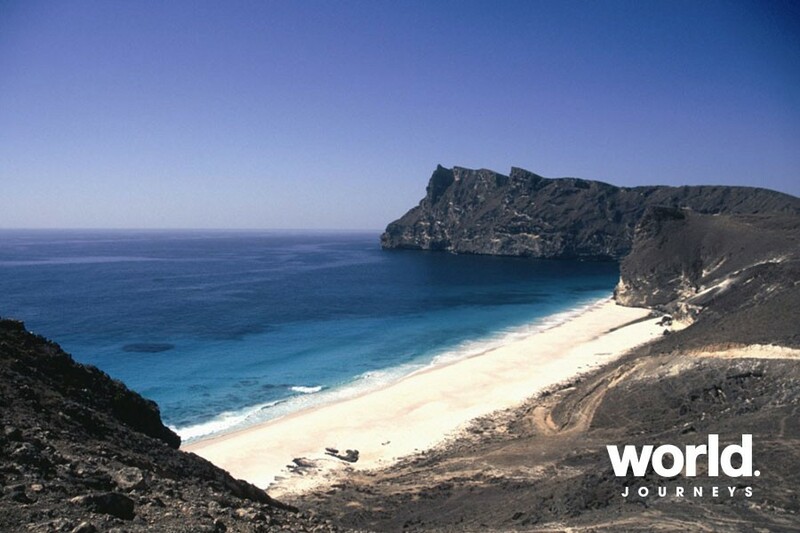 You then head for the coastal town of Sur, renowned for its dhow shipyard in bygone era. Unfortunately, the operation at the yard has almost been completely shut down. You will have lunch at a local Sea Food Restaurant and then continue to Ras Al Jinz and check in at Ras Al Jinz Beach Hotel. You can visit the turtle sanctuary at Ras Al Jinz, where at night the Green Turtles, after a journey of thousands of kilometers will come ashore to lay their eggs. Overnight stay at Ras Al Jinz. Day 3: Sur > Muscat Return to Muscat via the scenic coastal road. En route visit Bibi Mariam Tomb in Qalhat (it is only a photo stop as it is currently closed for renovation), the picturesque Wadi Tiwi, Fins Beach with its white sand, the limestone Sinkhole in Bimah and Village of Quriyat. Picnic Lunch will be served en route. In the evening, arrive at Muscat where you will be dropped off to the your hotel or airport. • Accommodation on Single/ Double sharing basis in 3 star accommodation • 4WD with a maximum of 4 passengers in one car with English speaking driver guide. • Breakfast and dinner daily • Picnic lunch on day 03. • All Entrance fees. Supplements apply over peak periods - please contact World Journeys for details.